I’ve grown quite fond of Czech lunches, but it occurs to me that many of my friends back home may be surprised to see what exactly we eat here at midday. A few things you should know about Czech culture, before we begin. Lunch is the big meal of the day. Breakfasts vary from family to family but tend to be light and dinners are more of a “tea” or “leftovers” kind of thing. Lunch is where it’s at. Also, soup is always, always served with lunch, though my school has an optional soup line and I don’t always partake. Another sidenote: There are two menu listings at my school and I’ve finally learned enough Czech to know how to avoid the weirder things, so the following pictures are several weeks worth of the “better options” in my school’s cafeteria. 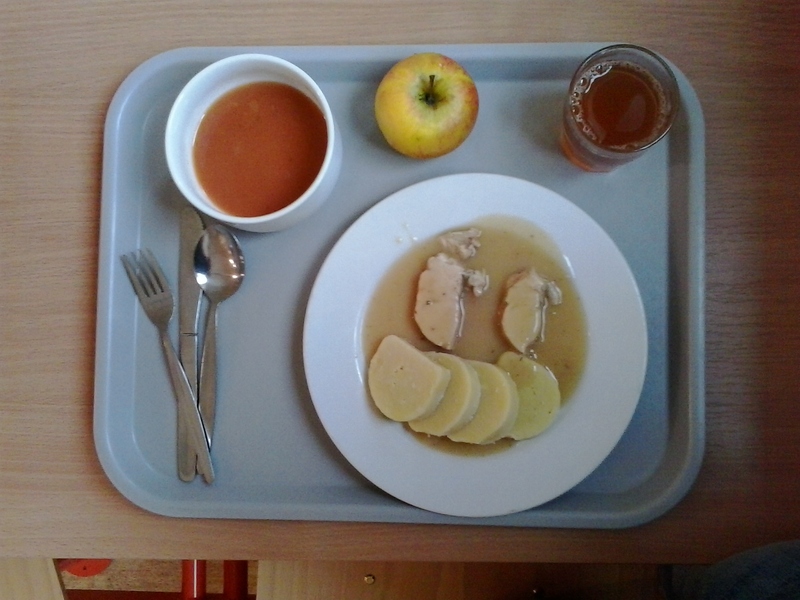 Pork and potato dumplings in gravy with soup, apple and juice (called šťáva). The meat / carb ratio in this country can be a little disturbing. As in…very, very little meat. Ever. Thank goodness the carbs are good enough to carry the show by themselves. 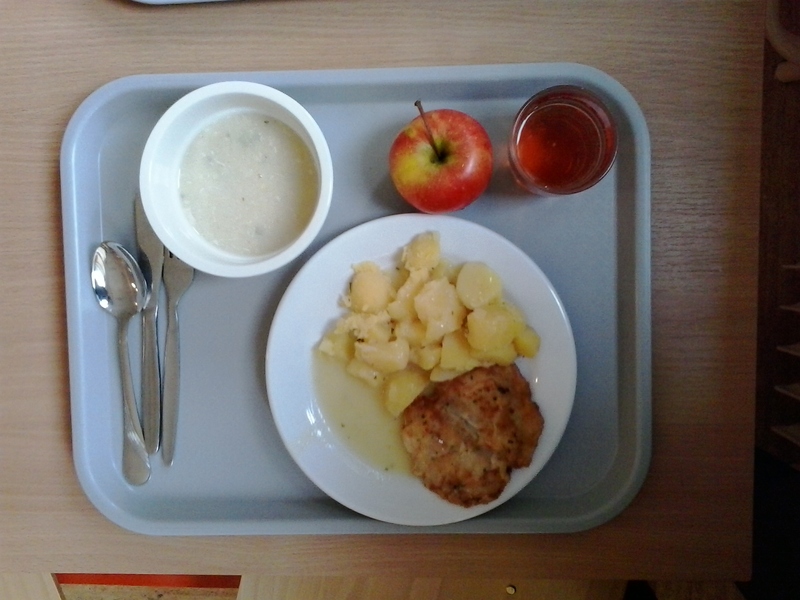 Battered pork with boiled potatoes, soup, apple and šťáva. Cultural observation: nearly ever dish is served with some kind of sauce. Dry meals are unacceptable. If you gave a Czech a steak served by itself, they wouldn’t know how to eat it. 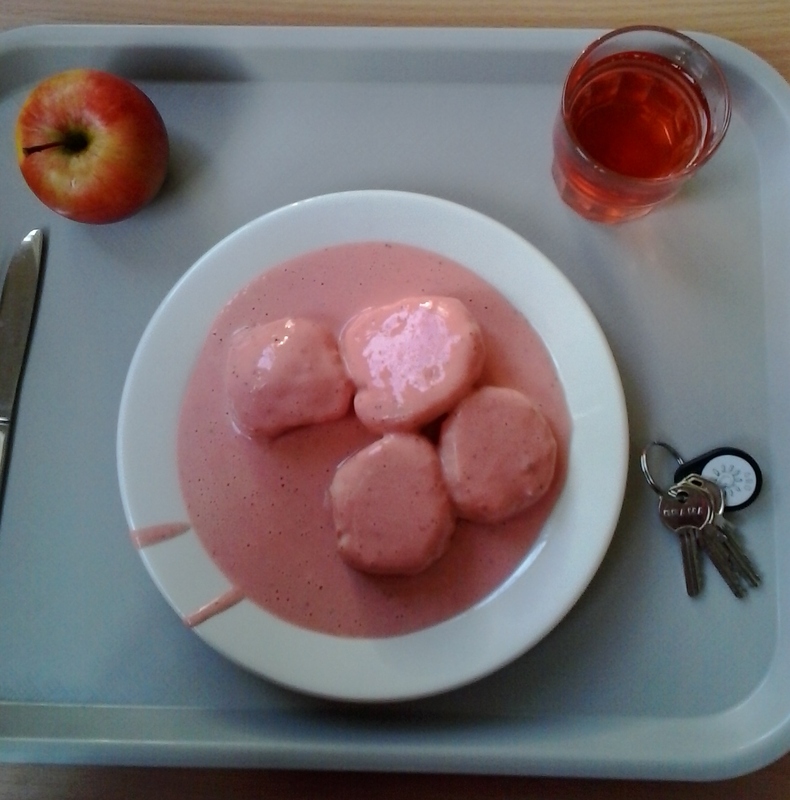 Dumplings in strawberry sauce, apple and tea. Yes. This is lunch. And, yes, it tastes exactly the way you’d expect it to. 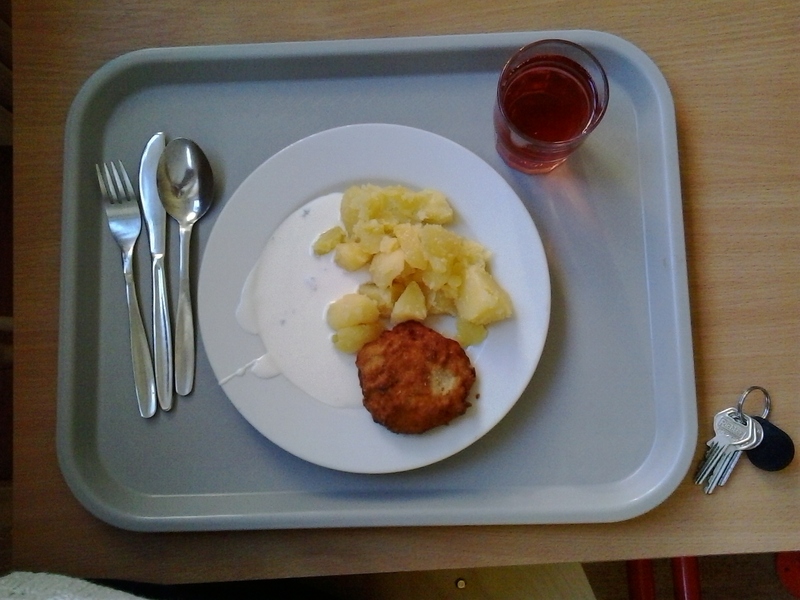 Fried fish with boiled potatoes and yogurt dressing. And šťáva. I still occassionally have trouble understanding the lunch menu. “Jogurtoví dresínk” is always a tie-breaker. It redeems the foulest of foods. 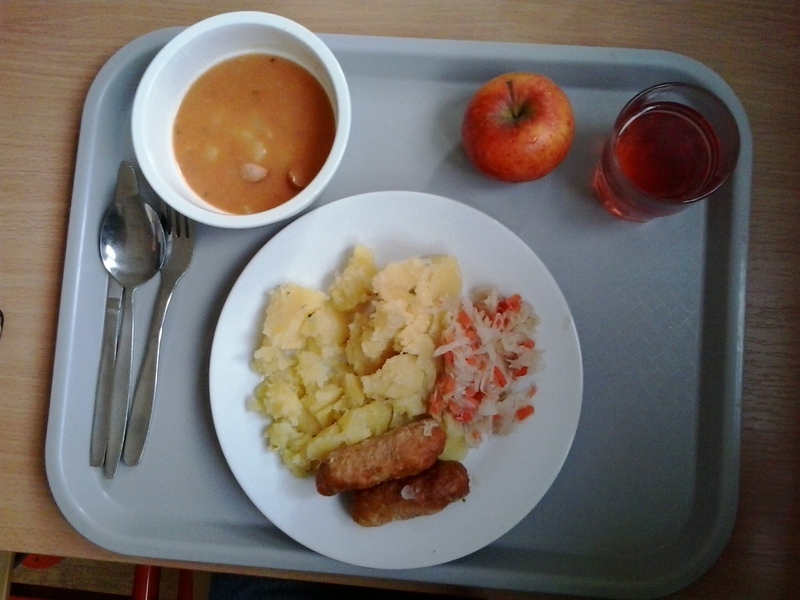 Mini-meatloafs, potato mush, carrot and cabbage salad with potato / sausage soup, an apple and šťáva. It should be mentioned that even though that meatloaf looks a lil’ suspicious, it’s the bomb. 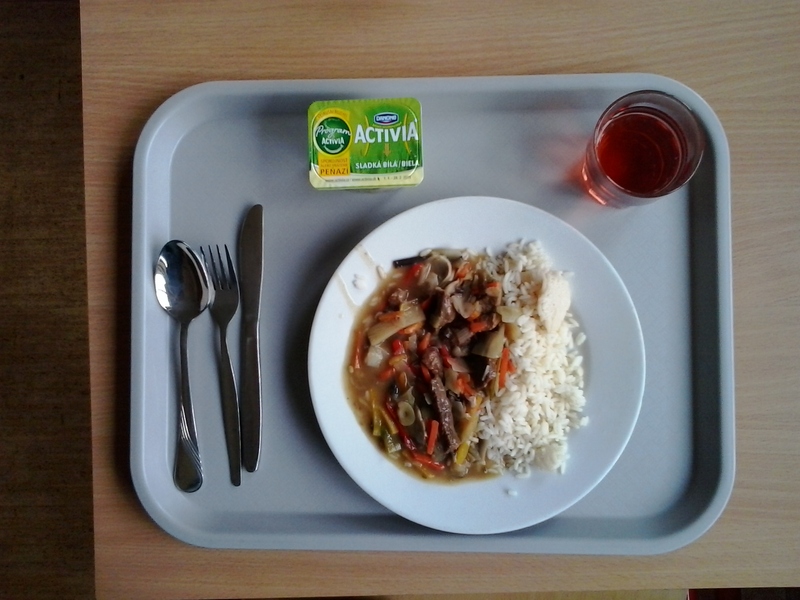 Beef and vegetable stir-fry with rice, yogurt and šťáva. I avoid the rice whenever possible because it tends to be too salty – a side-effect of living in a country where all the cooks are smokers. 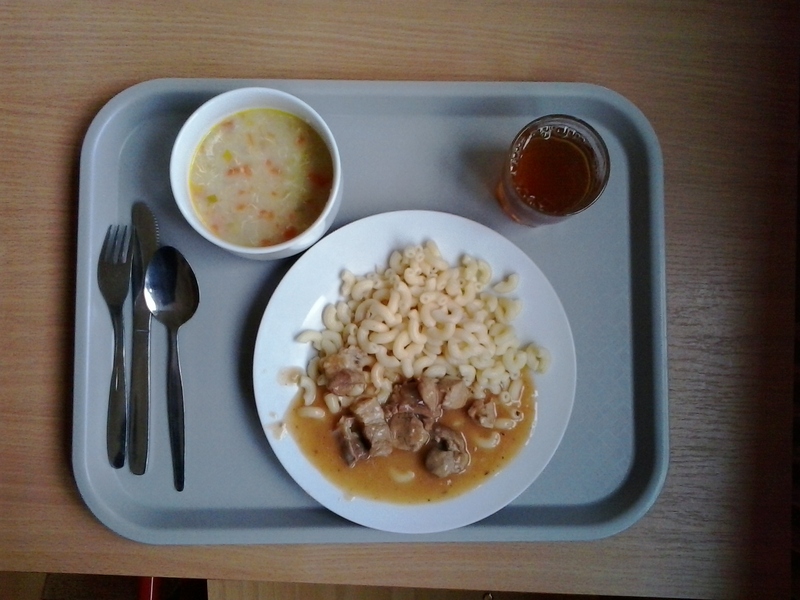 Pork and noodles in “Universal Brown Sauce” (I didn’t make up that term – Czechs actually call it that), with soup and šťáva. Pork, “Universal Brown Sauce (with chunks of hot dog! 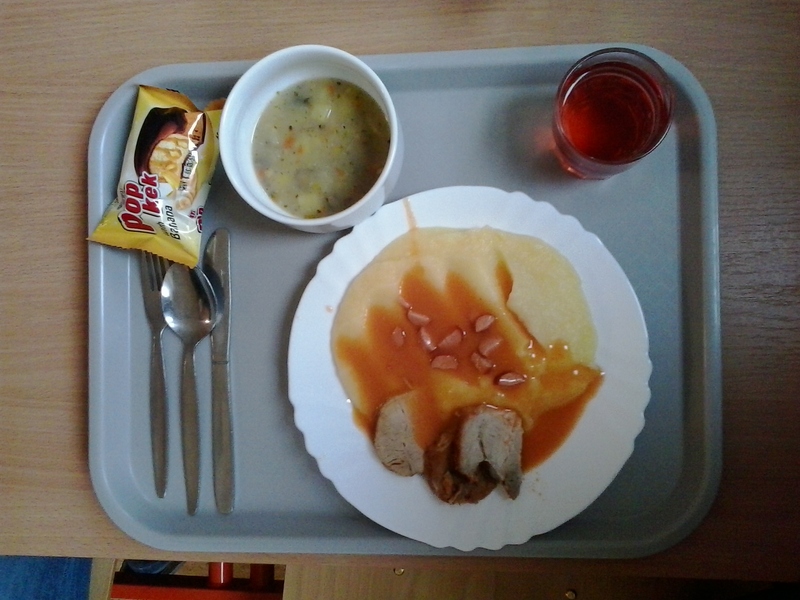 )” and mashed potatoes with dill / potato soup, a chocolate-banana cake and šťáva. Mashed potatoes in this country are really more like pureed potatoes. Very soupy. Very delicious. 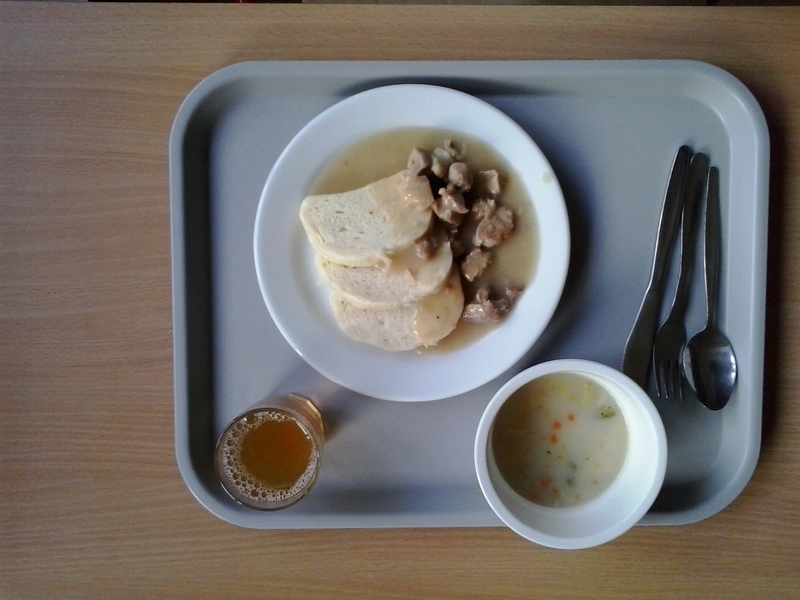 Pork and gravy with bread dumplings, soup and šťáva. Bread dumplings are always a good call. Always. 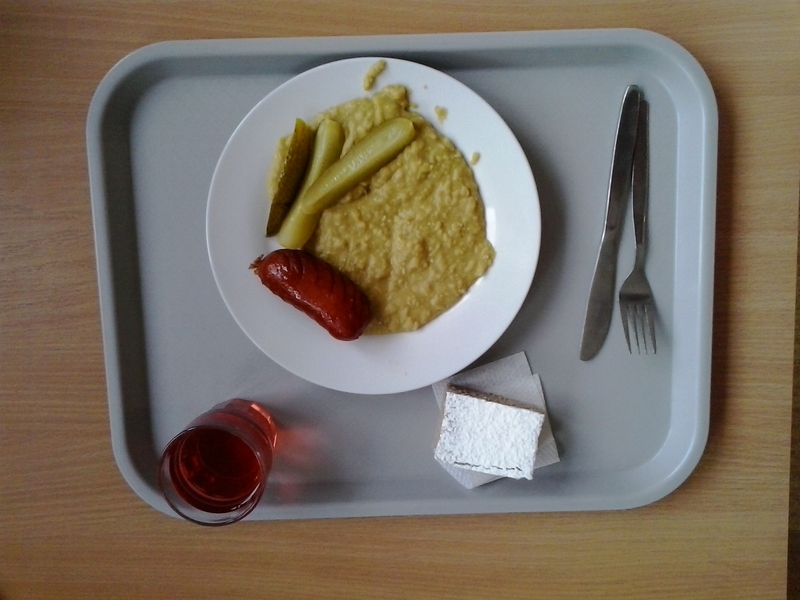 Sausage, mashed peas and pickles with a piece of “chocolate cake” and šťáva. 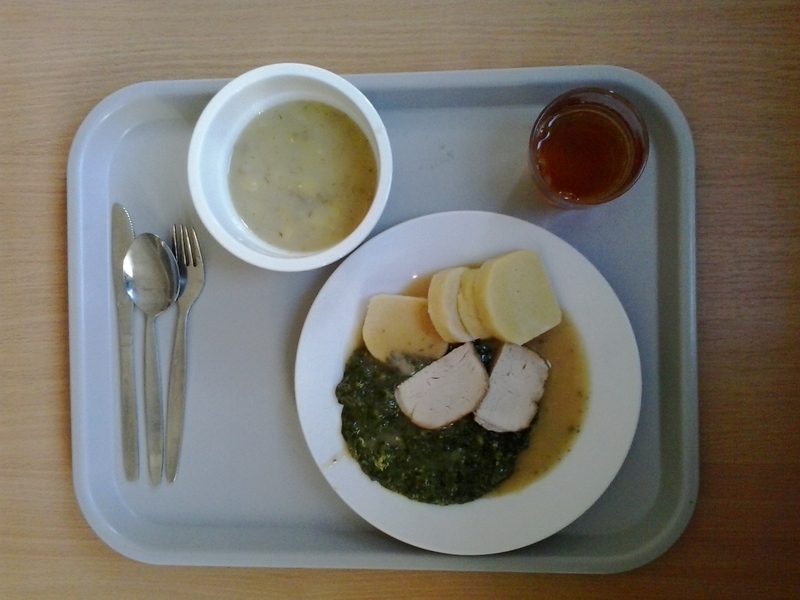 Pork with spinach, gravy and potato dumplings. Dill / potato soup and šťáva. This is another one of my favorites and it also happens to be a very traditional Czech meal. Sometimes in restaurants, they’ll serve the spinach with garlic cloves. Mmmm, good! 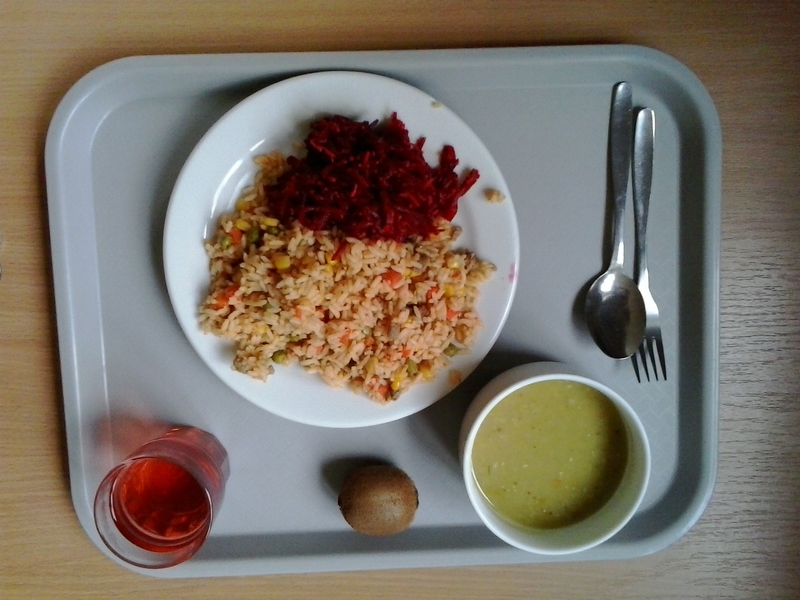 Fried rice, beets, pea soup, a kiwi (because, why the heck not?) and šťáva. For those of you who are too American to know this, the beets are the diced up red things. Deeelicious. 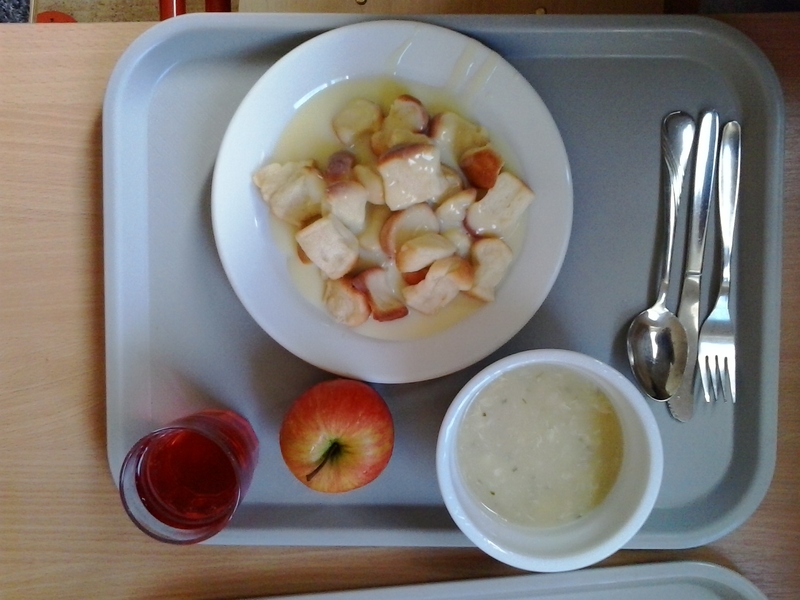 Mini-yeast rolls in cream sauce, soup, apple, šťáva. This entry was tagged cafeteria food, Czech Republic, dumplings, foreign kitchens, lunch, photo documentary, school, traditional cuisine, travel. Bookmark the permalink. As a Czech I must say: What a great collection! Unfortunately! !